Michigan is the largest Midwestern wine producer with a climate that produces temperatures predictably below freezing. So one would think that Michigan is in a position to be a leading ice wine producer. In fact, there is limited ice wine production in Michigan. 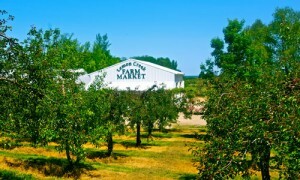 Lemon Creek, one of a limited number of Michigan ice wine producers, is also one of the oldest wineries in Southwest Michigan. Lemon grows 19 varieties of wine grapes on 150 acres and was among the first area wineries to plant vinifera grapes in 1980. Jeff’s brother Tim says the inherent challenges of making ice wine are why more wineries don’t produce the product in spite of the constant consumer demand. 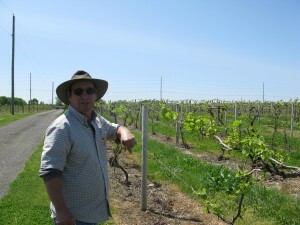 The challenge of making ice wine starts in the vineyard and continues into the actual wine production process, he said. Lemon Creek uses Vidal Blanc to make most of its ice wine because it ripens late and has thick skins. “At Lemon Creek, the Vidal Blanc grown on the highest vineyard site does not normally lose its leaves until after Thanksgiving,” Jeff said. The relatively late frost date for Lemon Creek stems from the location of the vineyard, over 350 feet above Lake Michigan which is six miles distant. Lemon Creek does not ‘hill up” or place dirt around the trunks of the Cab Sauv vines in the winter to protect them from freeze damage as many Michigan grape growers do. However, it has not been below -15F in the vineyard since ’94, the year that Jeff said he had to replace all his vinifera vines when they died of cold exposure. Getting Cab Sauv grapes to hang on the vines long enough to make ice wine is a challenge. Netting must be placed under the vines to catch the berries that can fall off during winter storms. Netting is not used for the Vidal Blanc ice wine. Last winter, a wind storm just before harvest knocked many of the Vidal berries off the vines, Jeff said. “Not surprisingly, the yield per vine for ice wine is about a quarter of the yield for regular wine. Forty gallons of ice wine for a ton of grapes is pretty good. The grapes will dehydrate down to nothing eventually so we have to get them off at the perfect time,” Jeff said. Tim said that the high sugar content in ice wine grapes does more than enhance ice wine flavor. Sugar is also a form of antifreeze. Sugar does not freeze until it reaches a temperature of 12F. So at the sub freezing harvest temperatures, the ice wine grapes are hard, but not completely frozen. Because the higher brix ice wine juice is harder to ferment than regular wine, a strong strain of yeast, like Lallemand R2, is used. Fermentation is checked several times a week to make sure it does not slow or get stuck. 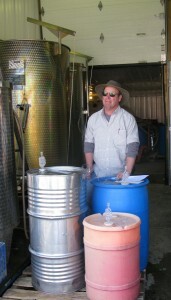 According to Jeff, it can take months to ferment ice wine. The juice is fermented down to 22-24 brix which is the residual sugar level in the finished ice wine. The acidity in the grapes does not decline much between fall and winter which gives the ice wine the desired balance of sweetness and acidity, he said. For the 2011/2012 harvest, the Vidal ice wine grapes had a TA of 8.4 g/l and a pH of 3.48. Jeff said that Lemon Creek does not adjust the acidity in its ice wines. Ice wine production is a small part of Lemon Creek’s total production of 8,000 cases per year. They produce 410 gallons per year of Vidal ice wine and 27 gallons of Cab Sauv ice wine and an even smaller amount of Chambourcin ice wine in the years that it’s made. 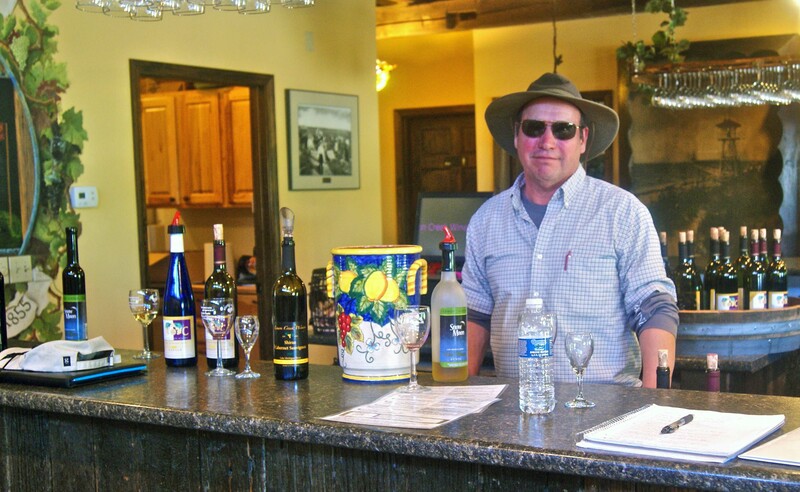 A substantial portion of Lemon Creek ice wine is sold in $5 samples in the winery’s tasting room. Each ice wine tasting pour is three-quarters of an ounce. The 375 ml bottle of Vidal ice wine sells for $35 and the 200 ml bottle of Cab Sauv ice wine is $55. 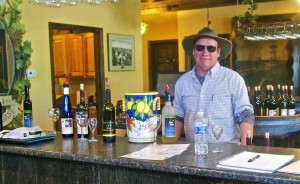 Lemon Creek expects to have the 2011/2012 vintage ice wine available at the winery’s tasting room in September. So why go through all the trouble? ‘Because we can produce an extraordinary ice wine here,” Jeff says.